There isn't anything that beats the enjoyment of being able to pick and eat your own home grown produce from a raised bed vegetable garden or orchard. Anyone who has grown their own tomatoes will testify to the difference in taste. Supermarkets demand fruit & vegetable varieties that have a long shelf life. By the time it gets to you it is probably already several weeks old or even longer if it has been in cold storage for a period before that. Growing your own fruit and/or veggies means that you can pick and eat them as you need. Home grown veggies are free from chemical preservatives and by growing your own you can ensure that they have not been exposed to herbicides and chemical pesticides or genetically modified in any way. Your vegetables will not all ripen at the same time giving you seasonal produce over a long period that not only tastes great but is full of nutrition. Thinking About Starting a Vegetable Garden? Yummy Gardens can help you get started or back on track. Whether you have an existing veggie garden that needs some tender loving care or require a new veggie garden to be set up from scratch we can help. We also grow our own seedlings which include current season heritage and heirloom varieties. We can plant out your new garden full of yummy veggies and also offer a service to replant throughout the year and as the seasons change. Vegetable gardens need to be placed in a location where they get the sun for at least six hours a day. Preferably the site should be protected from strong winds and a northerly aspect should ensure that the site receives the winter sun. Ideally you would have several garden beds or depending on the room available you can divide the bed into segments to ensure crop rotation occurs reducing the likelihood & severity of pests and diseases. Garden beds should be no wider than it is possible for you to reach in or across to pick your produce. For a new vegetable garden we recommend a raised bed vegetable garden which we then fill with an organic vegetable garden mix. In many areas it would take years to develop the existing soil to a suitable planting medium and the advantage of a raised bed is that it can be planted out immediately and you can commence harvesting and eating your produce within weeks in some cases. 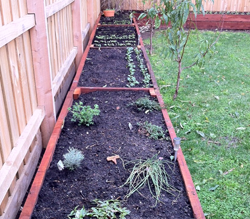 We prefer to build our raised beds vegetable gardens out of Cypress Macrocarpa or Ironbark. Both of these timbers are long lasting, termite resistant and contain no chemicals or preservatives. We have also built raised timber beds out of Red Gum, Native Cypress and Eco timber however have been disappointed with the quality of Red Gum in recent years and prefer not to use it. The Cypress Macrocarpa we use has been ethically sourced and salvaged from redundant trees and has a natural durability to termites and decay. We design and construct the raised garden beds to your requirements or permitted space available. We recommend that the beds are no more than 1200mm wide if you have access from both sides or 600mm wide if against a wall. In addition to timber beds we build raised vegetable garden beds with earth rings which are constructed of galvanized iron. The reason we use and recommend galvanized iron is that it is highly corrosion resistant and should last for many years. The iron we use is the same as used in iron water tank construction. It is a heavier grade than normal iron therefore prolonging the life of the ring. The diameters of our tanks are 900mm, 1200mm & 1500mm. Check out our Garden Gallery for examples of completed garden projects. If you move house at any time it is fairly easy to take the tank with you. If you want your beds to have that more permanent look or are keen on a Herb Garden why not consider a concrete block constructed garden. We render the blocks with a natural sand pigment or any colour you choose and can cap the top with new or second hand solid bricks. These garden beds look great in any backyard and will appeal to anyone looking to locate a bed close to your house. We provide an initial consultation and design at no cost to you and can assist with all your requirements. We will build your raised vegetable garden out of the material of your choice which could be sleepers using Cypress Macrocarpa, Ironbark or Native Cypress or alternatively you may go for the aesthetics of a galvanized earth tank or the permanence of a rendered block bed. Yummy Gardens pride ourselves on providing you a service from the very beginning right through to planting and mulching however if you wish to undertake some of the process yourself we are happy to work with you and provide any advice.